Just an amazing trio of female vocalists belting out a great cover arrangement. If you have a spare evening or two, surf YouTube for all Scott Bradlee's great arrangements of popular tunes in all the old styles (20's flapper, MoTown, New Orleans, Torch, Country...You name it).....and marvel at his assemblage of great musicians + one tamborinist + one tap-dancer, etc. A TV news report on the Topper Worlds that took place mid August in Pwhelli Wales. Whereas the Laser Radial is the interim junior class for the Optimist graduates in North America, the Topper holds this distinction in the U.K., with massive turnouts. This doesn't mean adults can't enjoy Toppers as I have posted before in this post and also this post. I've chunked together, into a PDF file, the plans for the Lark scow as published in Rudder magazine in the 1940's. It calls for a traditional build of the Lark but that doesn't mean you couldn't utilize modern technology and build it another way. To download the PDF plans click on the upward pointing arrow icon in the top right of the app bar. This will pop the PDF into another tab and you can print or download from there. Note that page 12 of the PDF file is blank. Click here for the William Kerr plans and instructions to build the Lark scow. Click here for the background post on the Lark scow. For The Rudder magazine's second DIY scow, the Swallow, click here. I took this from an old International Moth newsletter. It shows a Japanese fellow riding his skinny skiff Moth wrong way up (before foils). Sometimes there is nothing dignified about dinghy sailing. In my travels around the Net I've grabbed photos that interest me here and there. Every once in a while I'll repost. This black and white photo of the Classic 12 sq. meter Sharpie, the Olympic double-hander of 1956, is one of my favorites. I got it from a Brazilian blogger that was on the blog list of Doryman, but doesn't seem to be on his blog list now. 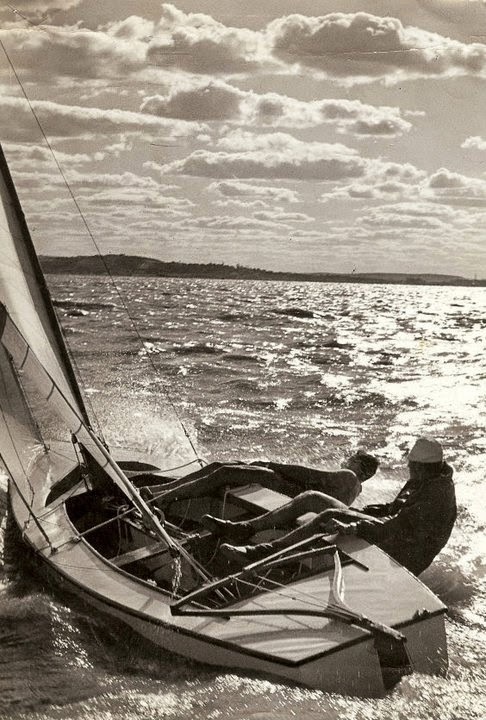 I assume the photo is from the late 1950's - early 1960's (new information says it was actually taken in the 1970's - see below), especially given the split tiller in use which was also popular on Classic Moth's from that time fame. The 12 sq. m. Sharpie is sailing on a large freshwater lagoon behind an ocean barrier island, Lagoa dos Patos - Duck Lagoon, in Southern Brazil. The two names I have attached to the photo are Gabriel Gonzales and Nelson Piccolo, who I assume are the sailors. If I had a larger resolution image this one would definitely be framed and sitting on a wall in my house. I would be interested in further attribution of the photographer because it is a great sailing photo. Gustavo Pacheo added this comment on the photo (July 29, 2015) which I've dragged over to the main post. Thanks Gustavo! "I think it was last year that I [saw] this great picture at the Veleiros do Sul web site. The helsman in the picture is Nelson Piccolo, and this picture is from the 70´s. We had discussed this picture in our [Facebook] group - Velejadores de Classicos - It is a great picture. Perfect light, enough action, it [is] like a poem. The contact [for] Nelson Piccolo [is] his sail loft Piccolo Sails: contato@piccolosails.com.br .. Fair winds !"